Almost half the eligible voters in Canada don’t vote. Any time there is an election, the media begins to harp about it, trying to bully the non-voters into voting. Which only makes it worse. I think Canadians don’t vote mostly due to feelings of disenfranchisement. A great many Canadians feel excluded from the process. Although they have passed a citizenship test most native born Canadians would have trouble with, many new Canadians don’t vote because they don’t feel entitled. Under Canada’s inequitable antiquated First Past The Post electoral system, some votes count more than others, but most don’t count at all. It’s disheartening to vote knowing your hope of actually being represented in parliament is slim to none. I well understand why nearly half of us don’t vote: we’ve learned from experience that our votes don’t count. Until our electoral system is modernized to a proportionate system, we are unlikely to see much increase in turnout. We need to ask, “Are the people of Canada electing a representative for their constituency or a political party to form the Government?” If we are electing a political party then we will forever be the losers and we are back to the same old partisan folly called the House of commons. Nothing changes. All parties need play the game of partisan politics in order to keep their support. Their interests lie in getting elected first, raising monies second, and media head lines third. If there is any time left, they will consider their roll of representation. The only parties that want Proportional Representation are the NDP, while they are not the power, and Greens. It could take more than a decade and 3 elections to change the voting system to a Proportional Representation system, it needs a change in the constitution, 7 provinces with 60% majority. By that time the Conservatives are back in power and the whole matter is brought to a halt and Canada will be back to square one. Sounds very cynical, I know. We cannot change to Proportional Representation in time for the next election due in 2015 but, we can effect a change. Canada needs a contract between MPs and their constituents which includes a Job Description and a Recall clause. 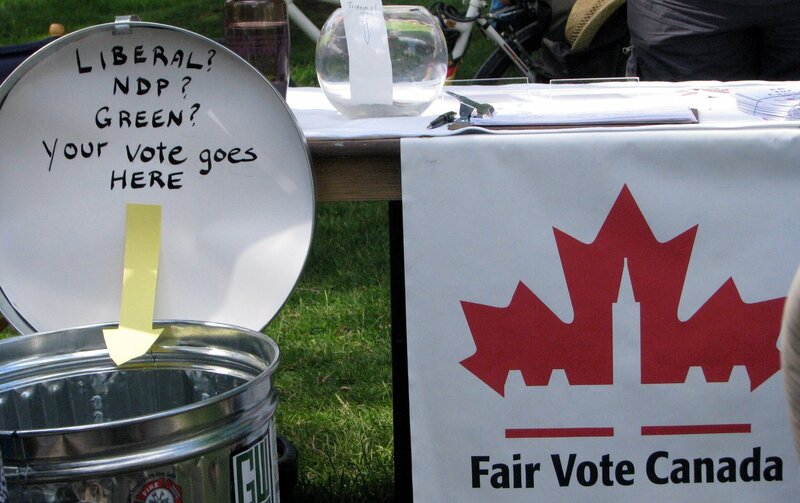 See http://fairelection.ca/ for more details. I’m sure you’re correct in saying we won’t have Proportional Representation in time for the 2015 election, Rick. After all, Mr. Harper’s Proportional Representation advocacy stopped the moment he became Prime Minister. That’s why I can well understand why you might not trust Mr. Mulcair to follow through on his support of Proportional Representation should he find himself in the Prime Minister’s chair come 2015. As it stands at the moment, I think the only Registered Federal Political Party actively opposed to Proportional Representation is the Conservative Party of Canada. I quite agree that our government needs to be accountable to the citizens in reality, which is why support Mr. Chong’s electoral reform bill and proportional representation. What I don’t understand is what makes you think MPs would even consider adopting “a contract between MPs and their constituents which includes a Job Description and a Recall clause” before the 2015 election. If you want to write a guest post explaining the specifics of what’re after, and how you think it can be accomplished, I’d be willing to publish it here.